In this part we'll create a simplified version of Foot2Meter, the application that was introduced in part 1. If you haven't done so yet, from the downloads section, download foot2metersimpcb.zip to a folder of your choice, such as \CppTutorials. Hold your horses! Don't unzip it now: every project will get it's own directory, and it is best to keep all the original files in \CppTutorials. Create a new directory: \CppTutorials\Foot2MeterSimp. Of course, you can choose other names for your directories and projects. But if you use the structure that I propose here, it will be a lot easier to follow along. Unzip foot2metersimp.zip to directory \CppTutorials\Foot2MeterSimp. As usual, we'll start with the end: how should our simplified Foot2Meter look like and what should it do? Compile the application. If you have forgotten how to do that, have a look at part 1. As with every succesful compilation, your application will start in the "environment" of the debugger. Notice that C++ Builder gives an error message and that it pauses the program, if you try to convert an invalid value. Continue your application. Afterwards you do not get a second error message, because in this simplified version of Foot2Meter we are not checking for a valid input (compare this behaviour with part 1). Stop the application and quit C++ Builder. Delete all the files from \CppTutorials\Foot2MeterSimp. C++ Builder's title bar shows the name of the new project: Project1. Notice the window with the title Form1. That window ("form") is the basis for your project. You also see the Editor window. That's where the source code can be viewed and edited. The source code is the result of the cooperation between C++ Builder and yourself: for every unit, a template is created automatically that you can complete. Unit1 is the name of the unit that goes with Form1. Builder created the files Unit1.cpp, Unit1.h, and Unit1.dfm, containing the source code for Form1, the main form of the application. In the Project Manager (panel at the top right), right click Project1.exe and rename it to Foot2MeterSimp. 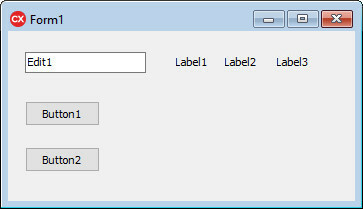 In the dialog, select directory \CppTutorials\Foot2MeterSimp. Next, save your files. Out of the project name, C++ Builder will create the name for the compiled executable. In our case this will be Foot2MeterSimp.exe. Therefore it is worthwile thinking of a suitable name BEFORE starting a project. In the tool palette, click on the icon of the TEdit component. It is on the Standard page of the palette. Next, click somewhere in the form. An Edit-box appears on the form, with the text Edit1. Below Button1, add a second TButton to the form. Size the form by dragging the bottom right corner of its border. C++ Builder will compile and run your program.